How would your family react if Australia was hit by a huge earthquake and tsunami? This story is about 13-year-old Hiroshi who experienced the earthquake and tsunami in Japan in 2011. Hiroshi shows a home video and describes what conditions were like for those living in Japan immediately after the event. See how Hiroshi and his family react to this disaster. Want to train a Japanese Sumo Wrestler? Coach a trainee sumo wrestler while exploring cultural features of the sport such as arena design and match rituals. Look at sample training schedules and arrange a wrestler's daily training activities. Identify cultural features of the sport and items such as the referee and wrestler. Watch your trainee wrestler try to become a champion by winning a match. Will scientists ever be able to accurately predict earthquakes? Imagine the number of lives that could be saved if this were possible. Dr Maryanne Demasi joins a group of researchers drilling into one of the most earthquake-prone regions on Earth as they try to improve earthquake prediction to add precious seconds to earthquake warning times. Remember the earthquake and following tsunami that hit Japan in March 2011 and damaged a nuclear power plant? Find out about the damage caused, what exploded and why, and the aftermath of the disaster. What debates about nuclear power plants were reignited by the events in Japan? Look through a photo album showing life in Japan. See photos such as shops around Shinjuku, cooking at home and teenagers playing computer games. Match each photo to a brief description of the activity. Answer a question about each activity. Complete a quiz that includes questions on all of the photos. 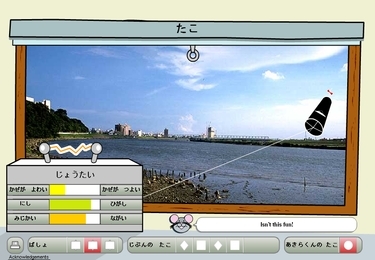 Fly kites in a range of places in Japan. Adjust compass directions, wind speed and flying height.